At 10am the principle of Opportunity High finishes her welcome speech to the students as the students go to leave the auditorium they discover that all the doors are locked and then the shooting starts. At first it seems like there is no rhyme or reason to who is shot but then they become more cold more calculated. As more students realize what is happening they have to decide what to do so they are not the next target, they all want to survive but in this unpredictable situations not everyone will. 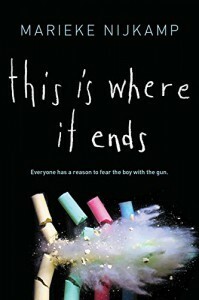 This book tackles a new and ever increasing phenomenon in our society of school shootings. As with all school shootings (I would think) everyone is caught completely off guard about what is actually happening in there school. I also think that the reactions that the students and teachers go through (those we have a point of view from and those we don't) react in accurate ways. You will always have those who try to help and save others, often with dire consequences. You could tell that Nijkamp thought about and possible researched the most effective way for a school shooting as Tyler's plan within this book is quite smart and would ensure mass casualties. I liked that Nijkamp decided to have twitter used in the novel but I actually think that it was under used by the author. Teenagers these days are on any app that you can think and probably some that we don't even know about. I think that is if you are going to have passages or conversations through twitter in the book you should also include other apps as well like Whatsapp, Snapchat or KIK (all of which I believe are very popular with teenagers today). Also strictly using twitter and what appears to be a blog also date this book as these are not the most popular mediums any more for the teenage age group. This is probably the downside of having these types of excerpts in your novel it becomes old very quickly. I did like that for those who were posting on twitter, the Media immediately caught on and started to contact them through there. At the beginning I thought there were going to be too many points of view in this book and I did get confused between Asha and Slyv at the beginning but I actually think that having multiple POV was a strong point of this book as each person was in a different place and reacted differently to the situation. However, I strongly feel that there was one point of view that was missing and that was one from Tyler. I felt like Tyler was never fully explored as a character in this book and I think this could have been rectified if Nijkamp would have had some of the chapters or parts from his point of view. We only really get second hand information about his life and lifestyle from his sister and ex-girlfriend. This second hand information only really touches on what possessed Tyler to make the step of taking his hatred out on his fellow student and teachers. I just felt like there was more to the story there than what was revealed. This was overall an interesting read for me, however, I think this book could have been excellent if Nijkamp would have taken the time to possible research what was popular with teenagers and added in additional social media aspects. Additionally, I think that Tyler needed to have a point of view of his own in order to really show the pain, suffering and wrongs he felt against him to take this type of action. Still it is not bad for a debut novel.